Slide 5 The State of Federal Data Science: What is Big Data? This symposium was scheduled for last November 18-19, 2013, but the Federal government was just coming to work after a historic shutdown over budget matters. The last topic is a new one to me and would seem to fit more in a Big Data Symposium. The real question seems to be how much real data science will we actually hear in the presentations and see in the posters? My quick answer is very little because this was more about NIST learning what data science is and its possible intersection with their specialty, measurement science, so it seems to ultimately about metrics for data science because standardizing metrics is NIST's mission. The prime example is when you see the wall clock in their conference room you know that is the standard for time! I walked around to look at the 38 posters whose titles and descriptions are in the Proceedings. Actually I assume there will be more proceedings based on the Breakout Session Reports and Next Steps at the end of the Symposium. ​The handout contained six questions (e.g. What are the current major data science needs for your users/customers? What role has HCI (human-computer interaction) played in addressing these needs? My response was Data Stories/Data Products that I do as a Data Scienctist/Data Journalist and refered to my poster on the wall for more details. I have submitted a Use Case to the NIST Big Data Working Group (that has a standard template for their 50 or so use cases) and suggested to NIST's Dr. Chris Greer and Wo Chang that they crowd-source Data Science on NIST's key data sets that can be made public to benefit both the NIST Big Data and Data Science activities. This was a commercial for Cloudera and their new Enterprise Data Hub, not Data Science and is the basis for my quote above. After you use their framework and open source software, what do you actually do with the data? Data.gov should be named DataCatalog.gov and Phil did not speak about the title: Datasets that Enable Rigorous Data Science Research. The Federal; Big Data Working Group Meetup does address both Datasets and Data Science that Enables Rigorous Data Science Research and Data Science for Business. Thomas Karl - Director, National Climatic Data Center (NOAA), etc. Dr. Francine Berman - Chair, Research Data Alliance / U.S. I suggested she become aware of the large Data Community and Data Science Community locally and internationally. The U.S. National Institute of Standards and Technology (NIST) wants to bring some metrics and rigor to the nascent but rapidly growing field of data science. The government agency is embarking on a project to develop by 2016 a framework that can be used by all industries to understand how to use, and measure the results from data science, and big data projects. NIST, an agency of the U.S. Department of Commerce, is holding a symposium on Tuesday and Wednesday at its Gaithersburg, Maryland, headquarters with big data specialists and data scientists to better understand the challenges around the emerging discipline. "Data science is pretty convoluted because it involves multiple data types, structured and unstructured," said event speaker Ashit Talukder, NIST chief for its information access division. "So metrics to measure the performance of data science solutions is going to be pretty complex." Starting with this symposium, the organization plans to seek feedback from industry about the challenges and successes of data science and big data projects. It then hopes to build a common taxonomy with the community that can be used across different domains of expertise, allowing best practices to be shared among multiple industries, Talukder said. While computer-based data analysis is nothing new, many of the speakers at the event talked about a fundamental industry shift now going on underway with data analysis. Doug Cutting, who originally created the Hadoop data processing platform noted that what made Hadoop unique is that it took a different approach to working with data. Instead of moving the data to a place where it can be analyzed -- an approach used with data warehouses -- the analysis takes place where the data is stored itself. "You can't move [large] data sets without major performance penalties," Cutting said. Since its creation in 2005, Apache Hadoop has set the stage for storing and analyzing data sets so large that they can not fit into a standard relational database, hence the term "big data." As these data sets grow larger, the tools for working with them are changing as well, noted Volker Markl, a professor and chair of the database systems and information management group at the Technische Universität Berlin. "Data analysis is becoming more complex," Markl said. As a discipline, data science is challenging in that it requires both understanding the technologies to handle the data, such as Hadoop and R, as well as the statistics and other forms of mathematics needed to harvest useful information from the data, Markl said. "A lot of companies are finding that they thought they were getting data science when they purchased Hadoop, but then they have to hire a data scientist to really do something useful with it," said symposium attendee Brand Niemann, director and senior enterprise architect at the data management consulting firm Semantic Community. Another emerging problem with data science is that it is very difficult to maintain a data analysis system over time, given its complexity. As the people who developed the algorithms to analyze data move on to other jobs or retire, an organization may have difficulty finding other people to understand how the code works, Markl said. Another challenge will be visualization, said Pak Chung Wong, chief scientist at the Department of Energy's Pacific Northwest National Laboratory. Visualization has long been a proven technique to help humans pinpoint trends and unusual events buried in large amounts of data, such as log files. 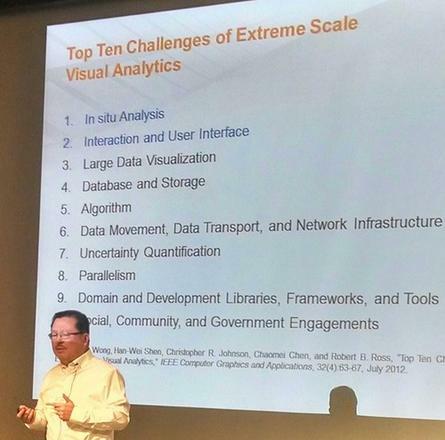 Standard visualization techniques may not work well with petabyte and exabyte-sized datasets, Wong warned. Such datasets may be arranged in hierarchies that can go 60 levels deep. "How can you represent that?" he asked. 9:00-9:30 Dr. Francine Berman - Chair, Research Data Alliance / U.S. I am both a data scientist and a data journalist. I engage in a wide range of data science activities, organize and participate in Data Science Teams and Meetups, and use data science to produce data products and stories like this one for the NIST Data Science Symposium. I will also show highlights of four recent Blog Posts to Data Science DC and Semantic Community. Two YouTube Videos will be shown (Schizo-7 minutes, Cancer-21 minutes) ​. Finally some highlights of the new Federal Big Data Working Group Meetups will be shown. All are welcome to participate in this new Meetup and their upcoming workshop in June. Brand Niemann, former Senior Enterprise Architect & Data Scientist with the US EPA, works as a data scientist, produces data science products, publishes data stories for Semantic Community, AOL Government, & Data Science & Data Visualization DC, and co-organizes the new Federal Big Data Working Group Meetup with Kate Goodier. My brief Bio is found below. I am both a data scientist and a data journalist. I engage in a wide range of data science activities (Slides 4-6), organize and participate in Data Science Teams (Slides 7-8), and use data science to produce data products and stories (Slides 9-16) like this one for the NIST Data Science Symposium, November 18-19, 2013. I show highlights of four recent Blog Posts to Data Science DC and Semantic Communtity. In my most recent Blog Post, I have suggested a mapping between the three Venn Diagrams for describing Data Science as shown in the table below. * Tried to cover all three. These are really just three different ways of describing something that is an evolving discipline and science influenced by the personal experience of three data scientists with different experience. My data story for the NBD-PWG providies a Roadmap (Slide 23) and concludes they need to Make a Technology Roadmap Project a Data Project (Slide 24). Essentially, I did a Relational and Graph Database pilot using the NIST Big Data Public Work Group Use Cases and Knowledge Bases. Big Data Uses Cases need to include Graph Databases since they contain stronger semantic relationships than RDBMS, reduce or eliminate the problems with RDMS, and because most Hadoop-type applications need them as well. I found only one Use Case that uses Graph Databases: 34 Enabling Face-Book like Semantic Graph-search on Scientific Chemical and Text-based Data; Talapady Bhat, NIST (Summary and Full). Our Semantic Medline – YARCData Graph Appliance Application for Dr. George Strawn’s Federal Big Data Senior Steering WG to discover new relationships between disease and treatments for mental illness, cancer, etc. Third, explain that “massive data sets generally involve growth not merely in the number of individuals represented (the “rows” of the database) but also in the number of descriptors of those individuals (the “columns” of the database). Moreover, we are often interested in the predictive ability associated with combinations of the descriptors; this can lead to exponential growth in the number of hypotheses considered, with severe consequences for error rates. That is, a naive appeal to a “law of large numbers” for massive data is unlikely to be justified; if anything, the perils associated with statistical fluctuations may actually increase as data sets grow in size.” Simply put: conventional analytics, statistics, and visualizations may not work. which of the 4 major computational constraints (Technical Architecture) they need to address with the hardware. Coordination of open, community-driven evaluations that focus on domains of general interest. The first symposium will be held November 18-19, 2013 on the NIST campus in Gaithersburg, MD. https://www-s.nist.gov/CRS/conf_disclosure.cfm?conf_id=6631 My Note: I did this. Participants who wish to give presentations of their technical perspectives or present posters (potentially with technical demonstrations) that address symposium topics should submit a brief one-page abstract and brief one-paragraph bio to datascience@nist.gov by October 4th, 2013. Submitters will be notified whether their perspectives have been selected for plenary or poster presentation by October 18th. Speakers, panelists, and poster presenters will be selected by the organizers based on relevance to symposium objectives and workshop balance. Due to the technical nature of the symposium, no marketing will be permitted. Primary challenges in and technical approaches to complex workflow components of Big Data systems, including ETL, lifecycle management, analytics, visualization & human-system interaction. Major forms of analytics employed in data science. Generation of ground truth for large datasets and performance measurement with limited or no ground truth. Methods to measure the performance of data analytic workflows where there are multiple subcomponents, decision points, and human interactions. Methods to measure the flow of uncertainty across complex data analytic systems. Approaches to formally characterizing end-to-end analytic workflows. Useful properties for data science reference datasets. Leveraging simulated data in data science research. Efficient approaches to sharing research data. My Note: I did this. Application: Preserve Census 2010 and 2000 – Title 13 data for a long term in order to provide access and perform analytics after 75 years. One must maintain data “as-is” with no access and no data analytics for 75 years; one must preserve the data at the bit-level; one must perform curation, which includes format transformation if necessary; one must provide access and analytics after nearly 75 years. Title 13 of U.S. code authorizes the Census Bureau and guarantees that individual and industry specific data is protected. Application: Accession, Search, Retrieval, and Long term Preservation of Government Data. Current Approach: 1) Get physical and legal custody of the data; 2) Pre-process data for virus scan, identifying file format identification, removing empty files; 3) Index; 4) Categorize records (sensitive, unsensitive, privacy data, etc. ); 5) Transform old file formats to modern formats (e.g. WordPerfect to PDF); 6) E-discovery; 7) Search and retrieve to respond to special request; 8) Search and retrieve of public records by public users. Currently 100’s of terabytes stored centrally in commercial databases supported by custom software and commercial search products. Futures: There are distributed data sources from federal agencies where current solution requires transfer of those data to a centralized storage. In the future, those data sources may reside in multiple Cloud environments. In this case, physical custody should avoid transferring big data from Cloud to Cloud or from Cloud to Data Center. Application: Survey costs are increasing as survey response declines. The goal of this work is to use advanced “recommendation system techniques” that are open and scientifically objective, using data mashed up from several sources and historical survey para-data (administrative data about the survey) to drive operational processes in an effort to increase quality and reduce the cost of field surveys. Current Approach: About a petabyte of data coming from surveys and other government administrative sources. Data can be streamed with approximately 150 million records transmitted as field data streamed continuously, during the decennial census. All data must be both confidential and secure. All processes must be auditable for security and confidentiality as required by various legal statutes. Data quality should be high and statistically checked for accuracy and reliability throughout the collection process. Use Hadoop, Spark, Hive, R, SAS, Mahout, Allegrograph, MySQL, Oracle, Storm, BigMemory, Cassandra, Pig software. Futures: Need to improve recommendation systems similar to those used in e-commerce (see Netflix use case) that reduce costs and improve quality while providing confidentiality safeguards that are reliable and publically auditable. Data visualization is useful for data review, operational activity and general analysis. It continues to evolve; mobile access important. Application: Survey costs are increasing as survey response declines. This use case has similar goals to that above but involves non-traditional commercial and public data sources from the web, wireless communication, electronic transactions mashed up analytically with traditional surveys to improve statistics for small area geographies, new measures and to improve the timeliness of released statistics. Current Approach: Integrate survey data, other government administrative data, web scrapped data, wireless data, e-transaction data, potentially social media data and positioning data from various sources. Software, Visualization and data characteristics similar to previous use case. Futures: Analytics needs to be developed which give statistical estimations that provide more detail, on a more near real time basis for less cost. The reliability of estimated statistics from such “mashed up” sources still must be evaluated. Application: Use of Cloud (Bigdata) technologies needs to be extended in Financial Industries (Banking, Securities & Investments, Insurance). Current Approach: Currently within Financial Industry, Bigdata and Hadoop are used for fraud detection, risk analysis and assessments as well as improving the organizations knowledge and understanding of their customers. At the same time, the traditional client/server/data warehouse/RDBM (Relational Database Management) systems are used for the handling, processing, storage and archiving of the entities financial data. Real time data and analysis is important in these applications. Futures: One must address GRC (Governance, Risk & Compliance) as well as CIA (Confidentiality, Integrity & Availability) issues, which can even be impacted by the SEC’s mandated use of XBRL (extensible Business Related Markup Language). While at the same time, addressing the influence these same issues can and will have within a Cloud Eco-system/Big Data environment, and their global impact across all Financial sectors. Current Approach: Data size is 15TB presently, growing about 1 TB/month. Processing on Amazon Web Services with Hadoop, Scribe, Hive, Mahout, Python. Standard libraries for machine learning and analytics, Latent Dirichlet Allocation, custom built reporting tools for aggregating readership and social activities per document. Futures: Currently Hadoop batch jobs are scheduled daily, but work has begun on real-time recommendation. The database contains ~400M documents, roughly 80M unique documents, and receives 5-700k new uploads on a weekday. Thus a major challenge is clustering matching documents together in a computationally efficient way (scalable and parallelized) when they’re uploaded from different sources and have been slightly modified via third-part annotation tools or publisher watermarks and cover pages. Application: Allow streaming of user selected movies to satisfy multiple objectives (for different stakeholders) -- especially retaining subscribers. Find best possible ordering of a set of videos for a user (household) within a given context in real-time; maximize movie consumption. Digital movies stored in cloud with metadata; user profiles and rankings for small fraction of movies for each user. Use multiple criteria – content based recommender system; user-based recommender system; diversity. Refine algorithms continuously with A/B testing. Current Approach: Recommender systems and streaming video delivery are core Netflix technologies. Recommender systems are always personalized and use logistic/linear regression, elastic nets, matrix factorization, clustering, latent Dirichlet allocation, association rules, gradient boosted decision trees and others. Winner of Netflix competition (to improve ratings by 10%) combined over 100 different algorithms. Uses SQL, NoSQL, MapReduce on Amazon Web Services. Netflix recommender systems have features in common to e-commerce like Amazon. Streaming video has features in common with other content providing services like iTunes, Google Play, Pandora and Last.fm. Application: Return in ~0.1 seconds, the results of a search based on average of 3 words; important to maximize quantities like “precision@10” or number of great responses in top 10 ranked results. Current Approach: Steps include 1) Crawl the web; 2) Pre-process data to get searchable things (words, positions); 3) Form Inverted Index mapping words to documents; 4) Rank relevance of documents: PageRank; 5) Lots of technology for advertising, “reverse engineering ranking” “preventing reverse engineering”; 6) Clustering of documents into topics (as in Google News) 7) Update results efficiently. Modern clouds and technologies like MapReduce have been heavily influenced by this application. ~45B web pages total. Application: BC/DR (Business Continuity/Disaster Recovery) needs to consider the role that the following four overlaying and inter-dependent forces will play in ensuring a workable solution to an entity's business continuity plan and requisite disaster recovery strategy. The four areas are; people (resources), processes (time/cost/ROI), technology (various operating systems, platforms and footprints) and governance (subject to various and multiple regulatory agencies). Futures: The complexities associated with migrating from a Primary Site to either a Replication Site or a Backup Site is not fully automated at this point in time. The goal is to enable the user to automatically initiate the Failover sequence. Both organizations must know which servers have to be restored and what are the dependencies and inter-dependencies between the Primary Site servers and Replication and/or Backup Site servers. This requires a continuous monitoring of both. Application: Monitoring and tracking of cargo as in Fedex, UPS and DHL. Current Approach: Today the information is updated only when the items that were checked with a bar code scanner are sent to the central server. The location is not currently displayed in real-time. An architectural diagram is in full description. Futures: This Internet of Things application needs to track items in real time. A new aspect will be status condition of the items which will include sensor information, GPS coordinates, and a unique identification schema based upon a new ISO 29161 standards under development within ISO JTC1 SC31 WG2. Application: Every physical product is made from a material that has been selected for its properties, cost, and availability. This translates into hundreds of billion dollars of material decisions made every year. However the adoption of new materials normally takes decades (two to three) rather than a small number of years, in part because data on new materials is not easily available. One needs to broaden accessibility, quality, and usability and overcome proprietary barriers to sharing materials data. One must create sufficiently large repositories of materials data to support discovery. Current Approach: Currently decisions about materials usage are unnecessarily conservative, often based on older rather than newer materials R&D data, and not taking advantage of advances in modeling and simulations. Application: Innovation of battery technologies through massive simulations spanning wide spaces of possible design. Systematic computational studies of innovation possibilities in photovoltaics. Rational design of materials based on search and simulation. These require management of simulation results contributing to the materials genome. Current Approach: PyMatGen, FireWorks, VASP, ABINIT, NWChem, BerkeleyGW, and varied materials community codes running on large supercomputers such as 150K core Hopper machine at NERSC produce results that are not synthesized. Futures: Need large scale computing at scale for simulation science. Flexible data methods at scale for messy data. Machine learning and knowledge systems that integrate data from publications, experiments, and simulations to advance goal-driven thinking in materials design. The current 100TB of data will become 500TB in 5 years. Application: Need to support large scale geospatial data analysis and visualization. As the number of geospatially aware sensors increase and the number of geospatially tagged data sources increases the volume geospatial data requiring complex analysis and visualization is growing exponentially. Current Approach: Traditional GIS systems are generally capable of analyzing a millions of objects and easily visualizing thousands. Data types include Imagery (various formats such as NITF, GeoTiff, CADRG), and vector with various formats like shape files, KML, text streams. Object types include points, lines, areas, polylines, circles, ellipses. Data accuracy very important with image registration and sensor accuracy relevant. Analytics include closest point of approach, deviation from route, and point density over time, PCA and ICA. Software includes Server with Geospatially enabled RDBMS, Geospatial server/analysis software – ESRI ArcServer, Geoserver; Visualization by ArcMap or browser based visualization. Futures: Today’s intelligence systems often contain trillions of geospatial objects and need to be able to visualize and interact with millions of objects. Critical issues are Indexing, retrieval and distributed analysis; Visualization generation and transmission; Visualization of data at the end of low bandwidth wireless connections; Data is sensitive and must be completely secure in transit and at rest (particularly on handhelds); Geospatial data requires unique approaches to indexing and distributed analysis. Application: Persistent surveillance sensors can easily collect petabytes of imagery data in the space of a few hours. The data should be reduced to a set of geospatial object (points, tracks, etc.) which can easily be integrated with other data to form a common operational picture. Typical processing involves extracting and tracking entities (vehicles, people, packages) over time from the raw image data. Futures: Typical problem is integration of this processing into a large (GPU) cluster capable of processing data from several sensors in parallel and in near real time. Transmission of data from sensor to system is also a major challenge. Application: Allow Intelligence Analysts to a) Identify relationships between entities (people, organizations, places, equipment) b) Spot trends in sentiment or intent for either general population or leadership group (state, non-state actors) c) Find location of and possibly timing of hostile actions (including implantation of IEDs) d) Track the location and actions of (potentially) hostile actors e) Ability to reason against and derive knowledge from diverse, disconnected, and frequently unstructured (e.g. text) data sources f) Ability to process data close to the point of collection and allow data to be shared easily to/from individual soldiers, forward deployed units, and senior leadership in garrison. Current Approach: Software includes Hadoop, Accumulo (Big Table), Solr, Natural Language Processing, Puppet (for deployment and security) and Storm running on medium size clusters. Data size in 10s of Terabytes to 100s of Petabytes with Imagery intelligence device gathering petabyte in a few hours. Dismounted warfighters would have at most 1-100s of Gigabytes (typically handheld data storage). Futures: Data currently exists in disparate silos which must be accessible through a semantically integrated data space. Wide variety of data types, sources, structures, and quality which will span domains and requires integrated search and reasoning. Most critical data is either unstructured or imagery/video which requires significant processing to extract entities and information. Network quality, Provenance and security essential. Application: Large national initiatives around health data are emerging, and include developing a digital learning health care system to support increasingly evidence-based clinical decisions with timely accurate and up-to-date patient-centered clinical information; using electronic observational clinical data to efficiently and rapidly translate scientific discoveries into effective clinical treatments; and electronically sharing integrated health data to improve healthcare process efficiency and outcomes. These key initiatives all rely on high-quality, large-scale, standardized and aggregate health data. One needs advanced methods for normalizing patient, provider, facility and clinical concept identification within and among separate health care organizations to enhance models for defining and extracting clinical phenotypes from non-standard discrete and free-text clinical data using feature selection, information retrieval and machine learning decision-models. One must leverage clinical phenotype data to support cohort selection, clinical outcomes research, and clinical decision support. Current Approach: Clinical data from more than 1,100 discrete logical, operational healthcare sources in the Indiana Network for Patient Care (INPC) the nation's largest and longest-running health information exchange. This describes more than 12 million patients, more than 4 billion discrete clinical observations. > 20 TB raw data. Between 500,000 and 1.5 million new real-time clinical transactions added per day. Application: Digital pathology imaging is an emerging field where examination of high resolution images of tissue specimens enables novel and more effective ways for disease diagnosis. Pathology image analysis segments massive (millions per image) spatial objects such as nuclei and blood vessels, represented with their boundaries, along with many extracted image features from these objects. The derived information is used for many complex queries and analytics to support biomedical research and clinical diagnosis. The full description has examples of 2-D and 3-D pathology images. Current Approach: 1GB raw image data + 1.5GB analytical results per 2D image. MPI for image analysis; MapReduce + Hive with spatial extension on supercomputers and clouds. GPU’s used effectively. The full description shows the architecture of Hadoop-GIS, a spatial data warehousing system over MapReduce to support spatial analytics for analytical pathology imaging. Futures: Recently, 3D pathology imaging is made possible through 3D laser technologies or serially sectioning hundreds of tissue sections onto slides and scanning them into digital images. Segmenting 3D microanatomic objects from registered serial images could produce tens of millions of 3D objects from a single image. This provides a deep “map” of human tissues for next generation diagnosis. 1TB raw image data + 1TB analytical results per 3D image and 1PB data per moderated hospital per year. Application: Data delivered from bioimaging is increasingly automated, higher resolution, and multi-modal. This has created a data analysis bottleneck that, if resolved, can advance the biosciences discovery through Big Data techniques. Current Approach: The current piecemeal analysis approach does not scale to situation where a single scan on emerging machines is 32TB and medical diagnostic imaging is annually around 70 PB excluding cardiology. One needs a web-based one-stop-shop for high performance, high throughput image processing for producers and consumers of models built on bio-imaging data. Futures: Our goal is to solve that bottleneck with extreme scale computing with community-focused science gateways to support the application of massive data analysis toward massive imaging data sets. Workflow components include data acquisition, storage, enhancement, minimizing noise, segmentation of regions of interest, crowd-based selection and extraction of features, and object classification, and organization, and search. Use ImageJ, OMERO, VolRover, advanced segmentation and feature detection software. Application: NIST/Genome in a Bottle Consortium integrates data from multiple sequencing technologies and methods to develop highly confident characterization of whole human genomes as reference materials, and develop methods to use these Reference Materials to assess performance of any genome sequencing run. Current Approach: The storage of ~40TB NFS at NIST is full; there are also PBs of genomics data at NIH/NCBI. Use Open-source sequencing bioinformatics software from academic groups (UNIX-based) on a 72 core cluster at NIST supplemented by larger systems at collaborators. Application: Given a metagenomic sample, (1) determine the community composition in terms of other reference isolate genomes, (2) characterize the function of its genes, (3) begin to infer possible functional pathways, (4) characterize similarity or dissimilarity with other metagenomic samples, (5) begin to characterize changes in community composition and function due to changes in environmental pressures, (6) isolate sub-sections of data based on quality measures and community composition. Current Approach: integrated comparative analysis system for metagenomes and genomes, front ended by an interactive Web UI with core data, backend precomputations, batch job computation submission from the UI. Provide interface to standard bioinformatics tools (BLAST, HMMER, multiple alignment and phylogenetic tools, gene callers, sequence feature predictors…). Futures: Management of heterogeneity of biological data is currently performed by relational database management system (Oracle). Unfortunately, it does not scale for even the current volume 50TB of data. NoSQL solutions aim at providing an alternative but unfortunately they do not always lend themselves to real time interactive use, rapid and parallel bulk loading, and sometimes have issues regarding robustness. Application: Diabetes is a growing illness in world population, affecting both developing and developed countries. Current management strategies do not adequately take into account of individual patient profiles, such as co-morbidities and medications, which are common in patients with chronic illnesses. Need to use advanced graph-based data mining techniques applied to EHR converted into a RDF graph, to search for Diabetes patients and extract their EHR data for outcome evaluation. Current Approach: Typical patient data records composed of 100 controlled vocabulary values and 1000 continuous values. Most values have a timestamp. Need to change traditional paradigm of relational row-column lookup to semantic graph traversal. Futures: Identify similar patients from a large Electronic Health Record (EHR) database, i.e. an individualized cohort, and evaluate their respective management outcomes to formulate most appropriate solution suited for a given patient with diabetes. Use efficient parallel retrieval algorithms, suitable for cloud or HPC, using open source Hbase with both indexed and custom search to identify patients of possible interest. Use Semantic Linking for Property Values method to convert an existing data warehouse at Mayo Clinic, called the Enterprise Data Trust (EDT), into RDF triples that enables one to find similar patients through linking of both vocabulary-based and continuous values. The time dependent properties need to be processed before query to allow matching based on derivatives and other derived properties. Application: The goal of the project is to analyze large, multi-modal medical data including different data types such as imaging, EHR, genetic and natural language. This approach employs the relational probabilistic models that have the capability of handling rich relational data and modeling uncertainty using probability theory. The software learns models from multiple data types and can possibly integrate the information and reason about complex queries. Users can provide a set of descriptions – say for instance, MRI images and demographic data about a particular subject. They can then query for the onset of a particular disease (say Alzheimer’s) and the system will then provide a probability distribution over the possible occurrence of this disease. Current Approach: A single server can handle a test cohort of a few hundred patients with associated data of 100’s of GB. Futures: A cohort of millions of patient can involve petabyte datasets. Issues include availability of too much data (as images, genetic sequences etc) that can make the analysis complicated. A major challenge lies in aligning the data and merging from multiple sources in a form that can be made useful for a combined analysis. Another issue is that sometimes, large amount of data is available about a single subject but the number of subjects themselves is not very high (i.e., data imbalance). This can result in learning algorithms picking up random correlations between the multiple data types as important features in analysis. Application: One needs reliable real-time prediction and control of pandemic similar to the 2009 H1N1 influenza. In general one is addressing contagion diffusion of various kinds: information, diseases, social unrest can be modeled and computed. All of them can be addressed by agent-based models that utilize the underlying interaction network to study the evolution of the desired phenomena. Current Approach: (a) Build a synthetic global population. (b) Run simulations over the global population to reason about outbreaks and various intervention strategies. Current 100TB dataset generated centrally with MPI based simulation system written in Charm++. Parallelism is achieved by exploiting the disease residence time period. Application: Model Social behavior including national security, public health, viral marketing, city planning, disaster preparedness. In a social unrest application, people take to the streets to voice unhappiness with government leadership. There are citizens that both support and oppose government. Quantify the degrees to which normal business and activities are disrupted owing to fear and anger. Quantify the possibility of peaceful demonstrations, violent protests. Quantify the potential for government responses ranging from appeasement, to allowing protests, to issuing threats against protestors, to actions to thwart protests. To address these issues, must have fine-resolution models (at level of individual people, vehicles, and buildings) and datasets. Current Approach: The social contagion model infrastructure includes different types of human-to-human interactions (e.g., face-to-face versus online media) to be simulated. It takes not only human-to-human interactions into account, but also interactions among people, services (e.g., transportation), and infrastructure (e.g., internet, electric power). These activity models are generated from averages like census data. Futures: Data fusion a big issue; how should one combine data from different sources and how to deal with missing or incomplete data? take into account heterogeneous features of 100s of millions or billions of individuals, models of cultural variations across countries that are assigned to individual agents? How to validate these large models? Application: Research and monitor different ecosystems, biological species, their dynamics and migration with a mix of custom sensors and data access/processing and a federation with relevant projects in area. Particular case studies: Monitoring alien species, monitoring migrating birds, wetlands. See ENVRI for integration of LifeWatch with other environmental e-infrastructures. Application: Increase the size of datasets and models that can be tackled with deep learning algorithms. Large models (e.g., neural networks with more neurons and connections) combined with large datasets are increasingly the top performers in benchmark tasks for vision, speech, and Natural Language Processing. One needs to train a deep neural network from a large (>>1TB) corpus of data (typically imagery, video, audio, or text). Such training procedures often require customization of the neural network architecture, learning criteria, and dataset pre-processing. In addition to the computational expense demanded by the learning algorithms, the need for rapid prototyping and ease of development is extremely high. Current Approach: The largest applications so far are to image recognition and scientific studies of unsupervised learning with 10 million images and up to 11 billion parameters on a 64 GPU HPC Infiniband cluster. Both supervised (using existing classified images) and unsupervised applications investigated. Futures: Large datasets of 100TB or more may be necessary in order to exploit the representational power of the larger models. Training a self-driving car could take 100 million images at megapixel resolution. Deep Learning shares many characteristics with the broader field of machine learning. The paramount requirements are high computational throughput for mostly dense linear algebra operations, and extremely high productivity for researcher exploration. One needs integration of high performance libraries with high level (python) prototyping environments. Application: Produce 3D reconstructions of scenes using collections of millions to billions of consumer images, where neither the scene structure nor the camera positions are known a priori. Use resulting 3d models to allow efficient and effective browsing of large-scale photo collections by geographic position. Geolocate new images by matching to 3d models. Perform object recognition on each image. 3d reconstruction can be posed as a robust non-linear least squares optimization problem in which observed (noisy) correspondences between images are constraints and unknowns are 6-d camera pose of each image and 3-d position of each point in the scene. Current Approach: Hadoop cluster with 480 cores processing data of initial applications. Note over 500 billion images on Facebook and over 5 billion on Flickr with over 500 million images added to social media sites each day. Futures: Need many analytics including feature extraction, feature matching, and large-scale probabilistic inference, which appear in many or most computer vision and image processing problems, including recognition, stereo resolution, and image denoising. Need to visualize large-scale 3-d reconstructions, and navigate large-scale collections of images that have been aligned to maps. Current Approach: 1) Acquisition and storage of a large volume (30 TB a year compressed) of continuous streaming data from Twitter (~100 million messages per day, ~500GB data/day increasing over time); (2) near real-time analysis of such data, for anomaly detection, stream clustering, signal classification and online-learning; (3) data retrieval, big data visualization, data-interactive Web interfaces, public API for data querying. Use Python/SciPy/NumPy/MPI for data analysis. Information diffusion, clustering, and dynamic network visualization capabilities already exist. Futures: Truthy plans to expand incorporating Google+ and Facebook. Need to move towards Hadoop/IndexedHBase & HDFS distributed storage. Use Redis as a in-memory database as a buffer for real-time analysis. Need streaming clustering, anomaly detection and online learning. Application: Capture information (manually entered, recorded multimedia, reaction times, pictures, sensor information) from many individuals and their devices and so characterize wide ranging individual, social, cultural and linguistic variation among several dimensions (space, social space, time). Current Approach: Use typically XML technology, traditional relational databases, and besides pictures not much multi-media yet. Futures: Crowd sourcing has been barely started to be used on a larger scale but with the availability of mobile devices, now there is a huge potential for collecting much data from many individuals, also making use of sensors in mobile devices. This has not been explored on a large scale so far; existing projects of crowd sourcing are usually of a limited scale and web-based. Privacy issues may be involved (A/V from individuals), anonymization may be necessary but not always possible. Data management and curation critical. Size could be hundreds of terabytes with multimedia. Application: CINET provides a common web-based platform for accessing various (i) network and graph analysis tools such as SNAP, NetworkX, Galib, etc. (ii) real-world and synthetic networks, (iii) computing resources and (iv) data management systems to the end-user in a seamless manner. Current Approach: CINET uses an Infiniband connected high performance computing cluster with 720 cores to provide HPC as a service. It is being used for research and education. Application: Develop performance metrics, measurement methods, and community evaluations to ground and accelerate the development of advanced analytic technologies in the areas of speech and language processing, video and multimedia processing, biometric image processing, and heterogeneous data processing as well as the interaction of analytics with users. Typically employ one of two processing models: 1) Push test data out to test participants and analyze the output of participant systems, 2) Push algorithm test harness interfaces out to participants and bring in their algorithms and test them on internal computing clusters. Current Approach: Large annotated corpora of unstructured/semi-structured text, audio, video, images, multimedia, and heterogeneous collections of the above including ground truth annotations for training, developmental testing, and summative evaluations. The test corpora exceed 900M Web pages occupying 30 TB of storage, 100M tweets, 100M ground-truthed biometric images, several hundred thousand partially ground-truthed video clips, and terabytes of smaller fully ground-truthed test collections. Futures: Even larger data collections are being planned for future evaluations of analytics involving multiple data streams and very heterogeneous data. As well as larger datasets, future includes testing of streaming algorithms with multiple heterogeneous data. Use of clouds being explored. Application: Promote collaborative and interdisciplinary research through federation of data management systems across federal repositories, national academic research initiatives, institutional repositories, and international collaborations. The collaboration environment runs at scale: petabytes of data, hundreds of millions of files, hundreds of millions of metadata attributes, tens of thousands of users, and a thousand storage resources. Current Approach: Currently 25 science and engineering domains have projects that rely on the iRODS (Integrated Rule Oriented Data System) policy-based data management system including major NSF projects such as Ocean Observatories Initiative (sensor archiving); Temporal Dynamics of Learning Center (Cognitive science data grid); the iPlant Collaborative (plant genomics); Drexel engineering digital library; Odum Institute for social science research (data grid federation with Dataverse). iRODS currently manages petabytes of data, hundreds of millions of files, hundreds of millions of metadata attributes, tens of thousands of users, and a thousand storage resources. It interoperates with workflow systems (NCSA Cyberintegrator, Kepler, Taverna), cloud and more traditional storage models and different transport protocols. The full description has a diagram of the iRODS architecture. Application: Discinnet has developed a web 2.0 collaborative platform and research prototype as a pilot installation now becoming deployed to be appropriated and tested by researchers from a growing number and diversity of research fields through communities belonging a diversity of domains. Its goal is to reach a wide enough sample of active research fields represented as clusters–researchers projected and aggregating within a manifold of mostly shared experimental dimensions–to test general, hence potentially interdisciplinary, epistemological models throughout the present decade. Current Approach: Currently 35 clusters started with close to 100 awaiting more resources and potentially much more open for creation, administration and animation by research communities. Examples range from optics, cosmology, materials, microalgae, health to applied math, computation, rubber and other chemical products/issues. Futures: Discinnet itself would not be Bigdata but rather will generate metadata when applied to a cluster that involves Bigdata. In interdisciplinary integration of several fields, the process would reconcile metadata from many complexity levels. Application: Establish social media-based infrastructure, terminology and semantic data-graphs to annotate and present technology information using ‘root’ and rule-based methods used primarily by some Indo-European languages like Sanskrit and Latin. Current approach: Many reports, including a recent one on Material Genome Project finds that exclusive top-down solutions to facilitate data sharing and integration are not desirable for federated multi-disciplinary efforts. However, a bottom-up approach can be chaotic. For this reason, there is need for a balanced blend of the two approaches to support easy-to-use techniques to metadata creation, integration and sharing. This challenge is very similar to the challenge faced by language developer at the beginning. One of the successful effort used by many prominent languages is that of ‘roots’ and rules that form the framework for creating on-demand words for communication. In this approach a top-down method is used to establish a limited number of highly re-usable words called ‘roots’ by surveying the existing best practices in building terminology. These ‘roots’ are combined using few ‘rules’ to create terms on-demand by a bottom-up step. Our efforts to develop automated and rule and root-based methods (Chem-BLAST -. http://xpdb.nist.gov/chemblast/pdb.pl ) to identify and use best-practice, discriminating terms in generating semantic data-graphs for science started almost a decade back with a chemical structure database. This database has millions of structures obtained from the Protein Data Bank and the PubChem used world-wide. Subsequently we extended our efforts to build root-based terms to text-based data of cell-images. In this work we use few simple rules to define and extend terms based on best-practice as decided by weaning through millions of popular use-cases chosen from over hundred biological ontologies. Futures: Create a cloud infrastructure for social media of scientific information where many scientists from various parts of the world can participate and deposit results of their experiment. Some of the issues that one has to resolve prior to establishing a scientific social media are: a) How to minimize challenges related to establishing re-usable, inter-disciplinary, scalable, on-demand, use-case and user-friendly vocabulary? b) How to adopt a existing or create new on-demand ‘data-graph’ to place an information in an intuitive way such that it would easily integrate with existing ‘data-graphs’ in a federated environment without knowing too much about the data management? c) How to find relevant scientific data without spending too much time on the internet? Start with resources like the Open Government movement, Material genome Initiative and Protein Databank. This effort includes many local and networked resources. Developing an infrastructure to automatically integrate information from all these resources using data-graphs is a challenge that we are trying to solve. Good database tools and servers for data-graph manipulation are needed. Application: Samples are exposed to X-rays from light sources in a variety of configurations depending on the experiment. Detectors (essentially high-speed digital cameras) collect the data. The data are then analyzed to reconstruct a view of the sample or process being studied. Current Approach: A variety of commercial and open source software is used for data analysis – examples including Octopus for Tomographic Reconstruction, Avizo (http://vsg3d.com) and FIJI (a distribution of ImageJ) for Visualization and Analysis. Data transfer is accomplished using physical transport of portable media (severely limits performance) or using high-performance GridFTP, managed by Globus Online or workflow systems such as SPADE. Futures: Camera resolution is continually increasing. Data transfer to large-scale computing facilities is becoming necessary because of the computational power required to conduct the analysis on time scales useful to the experiment. Large number of beamlines (e.g. 39 at LBNL ALS) means that aggregate data load is likely to increase significantly over the coming years and need for a generalized infrastructure for analyzing gigabytes per second of data from many beamline detectors at multiple facilities. Application: The survey explores the variable universe in the visible light regime, on time scales ranging from minutes to years, by searching for variable and transient sources. It discovers a broad variety of astrophysical objects and phenomena, including various types of cosmic explosions (e.g., Supernovae), variable stars, phenomena associated with accretion to massive black holes (active galactic nuclei) and their relativistic jets, high proper motion stars, etc. The data are collected from 3 telescopes (2 in Arizona and 1 in Australia), with additional ones expected in the near future (in Chile). Current Approach: The survey generates up to ~ 0.1 TB on a clear night with a total of ~100 TB in current data holdings. The data are preprocessed at the telescope, and transferred to Univ. of Arizona and Caltech, for further analysis, distribution, and archiving. The data are processed in real time, and detected transient events are published electronically through a variety of dissemination mechanisms, with no proprietary withholding period (CRTS has a completely open data policy). Further data analysis includes classification of the detected transient events, additional observations using other telescopes, scientific interpretation, and publishing. In this process, it makes a heavy use of the archival data (several PB’s) from a wide variety of geographically distributed resources connected through the Virtual Observatory (VO) framework. Futures: CRTS is a scientific and methodological testbed and precursor of larger surveys to come, notably the Large Synoptic Survey Telescope (LSST), expected to operate in 2020’s and selected as the highest-priority ground-based instrument in the 2010 Astronomy and Astrophysics Decadal Survey. LSST will gather about 30 TB per night. The schematic architecture for a cyber-infrastructure for time domain astronomy illustrated by a figure in full description. Figure: One possible schematic architecture for a cyber-infrastructure for time domain astronomy. Transient event data streams are produced by survey pipelines from the telescopes on the ground or in space, and the events with their observational descriptions are ingested by one or more depositories, from which they can be disseminated electronically to human astronomers or robotic telescopes. Each event is assigned an evolving portfolio of information, which would include all of the available data on that celestial position, from a wide variety of data archives unidied under the Virtual Observatory framework, expert annotations, etc. Representations of such federated information can be both human-readable and machine-readable. They are fed into one or more automated event characterization, classification, and prioritization engines that deploy a variety of machine learning tools for these tasks. Their output, which evolves dynamically as new information arrives and is processed, informs the follow-up observations of the selected events, and the resulting data are communicated back to the event portfolios, for the next iteration. Users (human or robotic) can tap into the system at multiple points, both for an information retrieval, and to contribute new information, through a standardized set of formats and protocols. This could be done in a (near) real time, or in an archival (not time critical) modes. Application: A cosmology discovery tool that integrates simulations and observation to clarify the nature of dark matter, dark energy, and inflation, some of the most exciting, perplexing, and challenging questions facing modern physics including the properties of fundamental particles affecting the early universe. The simulations will generate comparable data sizes to observation. Futures: Data sizes are Dark Energy Survey (DES) 4 PB in 2015; Zwicky Transient Factory (ZTF) 1 PB/year in 2015; Large Synoptic Sky Survey (LSST see CRTS description) 7 PB/year in 2019; Simulations > 10 PB in 2017. Huge amounts of supercomputer time (over 200M hours) will be used. Application: For DES (Dark Energy Survey) the data are sent from the mountaintop via a microwave link to La Serena, Chile. From there, an optical link forwards them to the NCSA as well as NERSC for storage and "reduction”. Here galaxies and stars in both the individual and stacked images are identified, catalogued, and finally their properties measured and stored in a database. Current Approach: Subtraction pipelines are run using extant imaging data to find new optical transients through machine learning algorithms. Linux cluster, Oracle RDBMS server, Postgres PSQL, large memory machines, standard Linux interactive hosts, GPFS. For simulations, HPC resources. Standard astrophysics reduction software as well as Perl/Python wrapper scripts, Linux Cluster scheduling. Futures: Techniques for handling Cholesky decompostion for thousands of simulations with matrices of order 1M on a side and parallel image storage would be important. LSST will generate 60PB of imaging data and 15PB of catalog data and a correspondingly large (or larger) amount of simulation data. Over 20TB of data per night. Application: Study CERN LHC (Large Hadron Collider) Accelerator and Monte Carlo producing events describing particle-apparatus interaction. Processed information defines physics properties of events (lists of particles with type and momenta). These events are analyzed to find new effects; both new particles (Higgs) and present evidence that conjectured particles (Supersymmetry) have not been detected. LHC has a few major experiments including ATLAS and CMS. These experiments have global participants (for example CMS has 3600 participants from 183 institutions in 38 countries), and so the data at all levels is transported and accessed across continents. Current Approach: The LHC experiments are pioneers of a distributed Big Data science infrastructure, and several aspects of the LHC experiments’ workflow highlight issues that other disciplines will need to solve. These include automation of data distribution, high performance data transfer, and large-scale high-throughput computing. Grid analysis with 350,000 cores running “continuously” over 2 million jobs per day arranged in 3 tiers (CERN, “Continents/Countries”. “Universities”). Uses “Distributed High Throughput Computing” (Pleasing parallel) architecture with facilities integrated across the world by WLCG (LHC Computing Grid) and Open Science Grid in the US. 15 Petabytes data gathered each year from Accelerator data and Analysis with 200PB total. Specifically in 2012 ATLAS had at Brookhaven National Laboratory (BNL) 8PB Tier1 tape; BNL over 10PB Tier1 disk and US Tier2 centers 12PB disk cache. CMS has similar data sizes. Note over half resources used for Monte Carlo simulations as opposed to data analysis. Futures: In the past the particle physics community has been able to rely on industry to deliver exponential increases in performance per unit cost over time, as described by Moore's Law. However the available performance will be much more difficult to exploit in the future since technology limitations, in particular regarding power consumption, have led to profound changes in the architecture of modern CPU chips. In the past software could run unchanged on successive processor generations and achieve performance gains that follow Moore's Law thanks to the regular increase in clock rate that continued until 2006. The era of scaling HEP sequential applications is now over. Changes in CPU architectures imply significantly more software parallelism as well as exploitation of specialized floating point capabilities. The structure and performance of HEP data processing software needs to be changed such that it can continue to be adapted and further developed in order to run efficiently on new hardware. This represents a major paradigm-shift in HEP software design and implies large scale re-engineering of data structures and algorithms. Parallelism needs to be added at all levels at the same time, the event level, the algorithm level, and the sub-algorithm level. Components at all levels in the software stack need to interoperate and therefore the goal is to standardize as much as possible on basic design patterns and on the choice of a concurrency model. This will also help to ensure efficient and balanced use of resources. Application The Belle experiment is a particle physics experiment with more than 400 physicists and engineers investigating CP-violation effects with B meson production at the High Energy Accelerator KEKB e+ e- accelerator in Tsukuba, Japan. In particular look at numerous decay modes at the Upsilon(4S) resonance to search for new phenomena beyond the Standard Model of Particle Physics. This accelerator has the largest intensity of any in the world but events simpler than those from LHC and so analysis is less complicated but similar in style compared to the CERN accelerator. Futures: An upgraded experiment Belle II and accelerator SuperKEKB will start operation in 2015 with a factor of 50 increased data with total integrated RAW data ~120PB and physics data ~15PB and ~100PB MC samples. Move to a distributed computing model requiring continuous RAW data transfer of ~20Gbps at designed luminosity between Japan and US. Will need Open Science Grid, Geant4, DIRAC, FTS, Belle II framework software. Application: EISCAT, the European Incoherent Scatter Scientific Association, conducts research on the lower, middle and upper atmosphere and ionosphere using the incoherent scatter radar technique. This technique is the most powerful ground-based tool for these research applications. EISCAT studies instabilities in the ionosphere, as well as investigating the structure and dynamics of the middle atmosphere. It is also a diagnostic instrument in ionospheric modification experiments with addition of a separate Heating facility. Currently EISCAT operates 3 of the 10 major incoherent radar scattering instruments worldwide with its facilities in in the Scandinavian sector, north of the Arctic Circle. Current Approach: The current running old EISCAT radar generates terabytes per year rates and does not present special challenges. Futures: The design of the next generation radar, EISCAT_3D, will consist of a core site with a transmitting and receiving radar arrays and four sites with receiving antenna arrays at some 100 km from the core. The fully operational 5-site system will generate several thousand times data of current EISCAT system with 40 PB/year in 2022 and is expected to operate for 30 years. EISCAT 3D data e-Infrastructure plans to use the high performance computers for central site data processing and high throughput computers for mirror sites data processing. Downloading the full data is not time critical, but operations require real-time information about certain pre-defined events to be sent from the sites to the operation center and a real-time link from the operation center to the sites to set the mode of radar operation on with immediate action. See figure in full description. Current Approach: ENVRI develops a Reference Model (ENVRI RM) as a common ontological framework and standard for the description and characterization of computational and storage infrastructures in order to achieve seamless interoperability between the heterogeneous resources of different infrastructures. The ENVRI RM serves as a common language for community communication, providing a uniform framework into which the infrastructure’s components can be classified and compared, also serving to identify common solutions to common problems. Note data sizes in a given infrastructure vary from gigabytes to petabytes per year. Futures: ENVRI’s common environment will empower the users of the collaborating environmental research infrastructures and enable multidisciplinary scientists to access, study and correlate data from multiple domains for "system level" research. It provides Bigdata requirements coming from interdisciplinary research. · Data acquisition: collects raw data from sensor arrays, various instruments, or human observers, and brings the measurements (data streams) into the system. · Data curation: facilitates quality control and preservation of scientific data. It is typically operated at a data centre. · Data access: enables discovery and retrieval of data housed in data resources managed by a data curation subsystem. · Data processing: aggregates the data from various resources and provides computational capabilities and capacities for conducting data analysis and scientific experiments. · Community support: manages, controls and tracks users' activities and supports users to conduct their roles in communities. As shown in Figure 2 of full description, the 5 sub-system map well to the architectures of the ESFRI Environmental Research Infrastructures. Application: This data feeds into intergovernmental Panel on Climate Change (IPCC) and uses custom radars to measures ice sheet bed depths and (annual) snow layers at the North and South poles and mountainous regions. Current Approach: The initial analysis is currently Matlab signal processing that produces a set of radar images. These cannot be transported from field over Internet and are typically copied to removable few TB disks in the field and flown “home” for detailed analysis. Image understanding tools with some human oversight find the image features (layers) that are stored in a database front-ended by a Geographical Information System. The ice sheet bed depths are used in simulations of glacier flow. The data is taken in “field trips” that each currently gather 50-100 TB of data over a few week period. Futures: An order of magnitude more data (petabyte per mission) is projected with improved instrumentation. Demands of processing increasing field data in an environment with more data but still constrained power budget, suggests low power/performance architectures such as GPU systems. The full descriptions gives workflows for different parts of problem and pictures of operation. Application: Synthetic Aperture Radar (SAR) can identify landscape changes caused by seismic activity, landslides, deforestation, vegetation changes and flooding. This is for example used to support earthquake science as well as disaster management. This use case supports the storage, application of image processing and visualization of this geo-located data with angular specification. Current Approach: Data from planes and satellites is processed on NASA computers before being stored after substantial data communication. The data is made public as soon as processed and requires significant curation due to instrumental glitches. The current data size is ~150TB. Futures: The data size would increase dramatically if Earth Radar Mission launched. Clouds are suitable hosts but are not used today in production. Application: NASA Center for Climate Simulation (NCCS) and NASA Atmospheric Science Data Center (ASDC) have complementary data sets, each containing vast amounts of data that is not easily shared and queried. Climate researchers, weather forecasters, instrument teams, and other scientists need to access data from across multiple datasets in order to compare sensor measurements from various instruments, compare sensor measurements to model outputs, calibrate instruments, look for correlations across multiple parameters, etc. Current Approach: The data includes MERRA (described separately) and NASA Clouds and Earth's Radiant Energy System (CERES) EBAF(Energy Balanced And Filled)-TOA(Top of Atmosphere) Product which is about 420MB and Data from the EBAF-Surface Product which is about 690MB. Data grows with each version update (about every six months). To analyze, visualize and otherwise process data from heterogeneous datasets is currently a time consuming effort that requires scientists to separately access, search for, and download data from multiple servers and often the data is duplicated without an understanding of the authoritative source. Often times accessing data is greater than scientific analysis time. Current datasets are hosted on modest size (144 to 576 cores) Infiniband clusters. Futures: The improved access will be enabled through the use of iRODS that enables parallel downloads of datasets from selected replica servers that can be geographically dispersed, but still accessible by users worldwide. iRODS operation will be enhanced with semantically organized metadata, and managed via a highly precise Earth Science ontology. Cloud solutions will also be explored. Application: This application produces global temporally and spatially consistent syntheses of 26 key climate variables by combining numerical simulations with observational data. Three-dimensional results are produced every 6-hours extending from 1979-present. This supports important applications like Intergovernmental Panel on Climate Change (IPCC) research and the NASA/Department of Interior RECOVER wildfire decision support system; these applications typically involve integration of MERRA with other datasets. The full description has a typical MERRA/AS output. Futures: Clouds are being investigated. The data is growing by one TB a month. Application: This builds datamining on top of reanalysis products including the North American Regional Reanalysis (NARR) and the Modern-Era Retrospective-Analysis for Research (MERRA) from NASA where latter described earlier. The analytics correlate aircraft reports of turbulence (either from pilot reports or from automated aircraft measurements of eddy dissipation rates) with recently completed atmospheric re-analyses. This is of value to aviation industry and to weather forecasters. There are no standards for re-analysis products complicating system where MapReduce is being investigated. The reanalysis data is hundreds of terabytes and slowly updated whereas turbulence is smaller in size and implemented as a streaming service. A typical turbulent wave image is in full description. Current Approach: Current 200TB dataset can be analyzed with MapReduce or the like using SciDB or other scientific database. Futures: The dataset will reach 500TB in 5 years. The initial turbulence case can be extended to other ocean/atmosphere phenomena but the analytics would be different in each case. Application: We need to understand and quantify contributions of natural and anthropogenic-induced patterns of climate variability and change in the 20th and 21st centuries by means of simulations with the Community Earth System Model (CESM). The results of supercomputer simulations across the world need to be stored and compared. Current Approach: The Earth Systems Grid (ESG) enables world wide access to Peta/Exa-scale climate science data with multiple petabytes of data at dozens of federated sites worldwide. The ESG is recognized as the leading infrastructure for the management and access of large distributed data volumes for climate change research. It supports the Coupled Model Intercomparison Project (CMIP), whose protocols enable the periodic assessments carried out by the Intergovernmental Panel on Climate Change (IPCC). Futures: Rapid growth of data with 30 PB produced at NERSC (assuming 15 end-to-end climate change experiments) in 2017 and many times more this worldwide. Application: Development of a Genome-Enabled Watershed Simulation Capability (GEWaSC) that will provide a predictive framework for understanding how genomic information stored in a subsurface microbiome, affects biogeochemical watershed functioning; how watershed-scale processes affect microbial functioning; and how these interactions co-evolve. Current Approach: Current modeling capabilities can represent processes occurring over an impressive range of scales (ranging from a single bacterial cell to that of a contaminant plume). Data crosses all scales from genomics of the microbes in the soil to watershed hydro-biogeochemistry. Data are generated by the different research areas and include simulation data, field data (hydrological, geochemical, geophysical), ‘omics data, and observations from laboratory experiments. Futures: Little effort to date has been devoted to developing a framework for systematically connecting scales, as is needed to identify key controls and to simulate important feedbacks. GEWaSC will develop a simulation framework that formally scales from genomes to watersheds and will synthesize diverse and disparate field, laboratory, and simulation datasets across different semantic, spatial, and temporal scales. Application: AmeriFlux and FLUXNET are US and world collections respectively of sensors that observe trace gas fluxes (CO2, water vapor) across a broad spectrum of times (hours, days, seasons, years, and decades) and space. Moreover, such datasets provide the crucial linkages among organisms, ecosystems, and process-scale studies—at climate-relevant scales of landscapes, regions, and continents—for incorporation into biogeochemical and climate models. Current Approach: Software includes EddyPro, Custom analysis software, R, python, neural networks, Matlab. There are ~150 towers in AmeriFlux and over 500 towers distributed globally collecting flux measurements. Futures: Field experiment data taking would be improved by access to existing data and automated entry of new data via mobile devices. Need to support interdisciplinary studies integrating diverse data sources. Current Approach: GIS based visualization. Data is around 4 TB a year for a city with 1.4M sensors in Los Angeles. Uses R/Matlab, Weka, Hadoop software. Significant privacy issues requiring anonymization by aggregation. Combine real time and historic data with machine learning for predicting consumption. Futures: Wide spread deployment of Smart Grids with new analytics integrating diverse data and supporting curtailment requests. Mobile applications for client interactions.